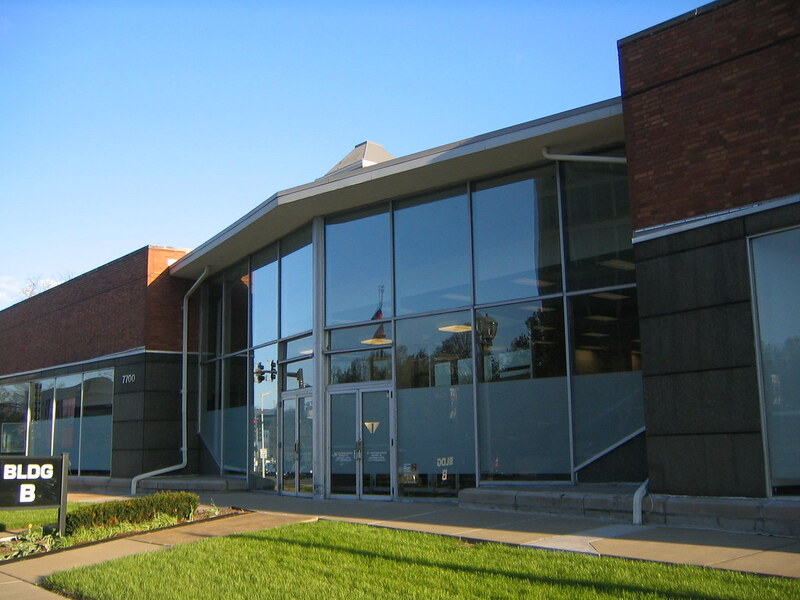 Vanishing STL: A Reprieve for Vandervoorts? Now that Centene Corporation has announced that they will build their new 750,000 S.F. 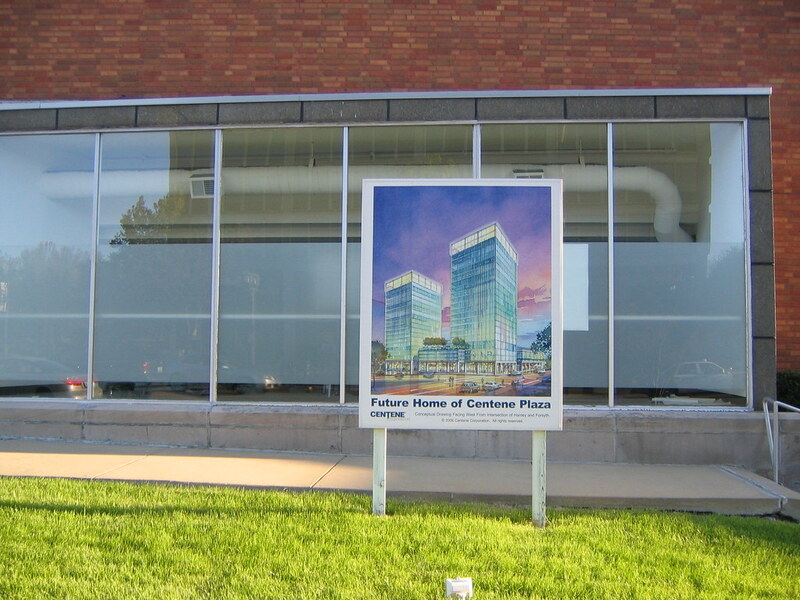 headquarters Downtown at Ballpark Village, what will become of Forsyth & Hanley? Opened on September 21st, 1951, The building known most recently as Library Limited (the bookstore I miss terribly) by Harris Armstrong was built as the first suburban branch of Scruggs Vandervoort Barney Department Store. Photo above from the Mercantile Library Collection. 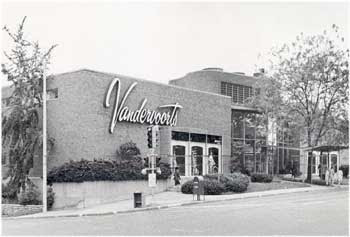 "Since the automobile has become such a powerful source toward decentralization throughout the country, we feel that the beginning of Vandervoort's suburban store, as part of our modernization and expansion program, is a particularly appropriate feature of our centennial year, which begins a new century for us." These were the words of Frank M. Mayfield, president of Scruggs Vandervoort Barney, Inc. about their new store in Clayton. Ironically sales at the Clayton branch were so strong that it sucked the life out of their Downtown store that was housed in the Century and Syndicate Trust Buildings. 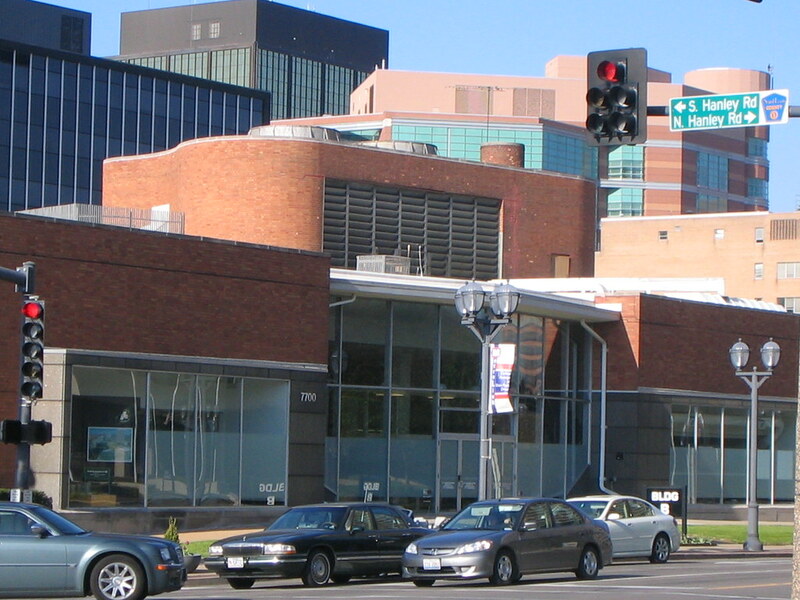 The resulting losses eventually led to the closure of both the Downtown and Clayton stores in 1967. Before the announcement Sunday of Centene's move Downtown, this sign foretold the buildings doom. 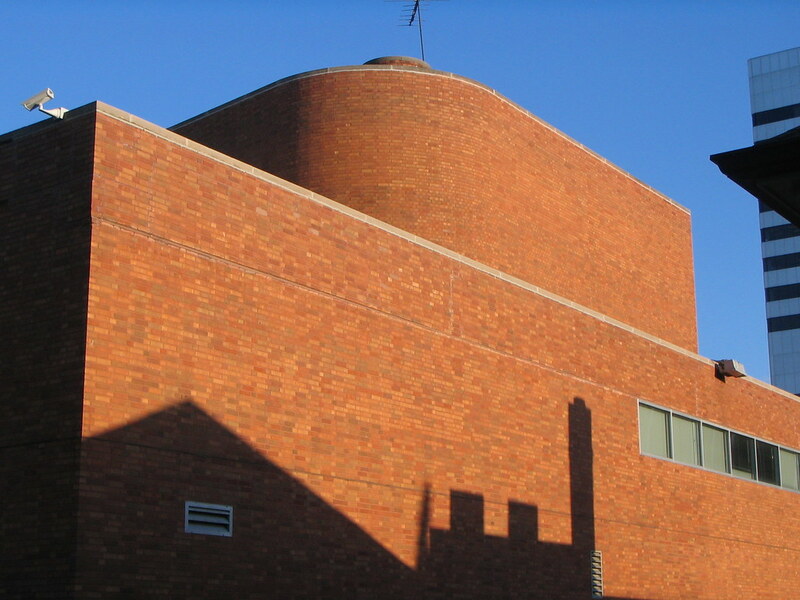 Just over 56 years from the day of its opening, the building that was built out of the idea of moving to the suburbs may have been saved (for the moment) by a reversal of the very trend from which it was built. Reduced to "Bldg. B". The original canopy extending out to Forsyth was removed years ago by a former owner. 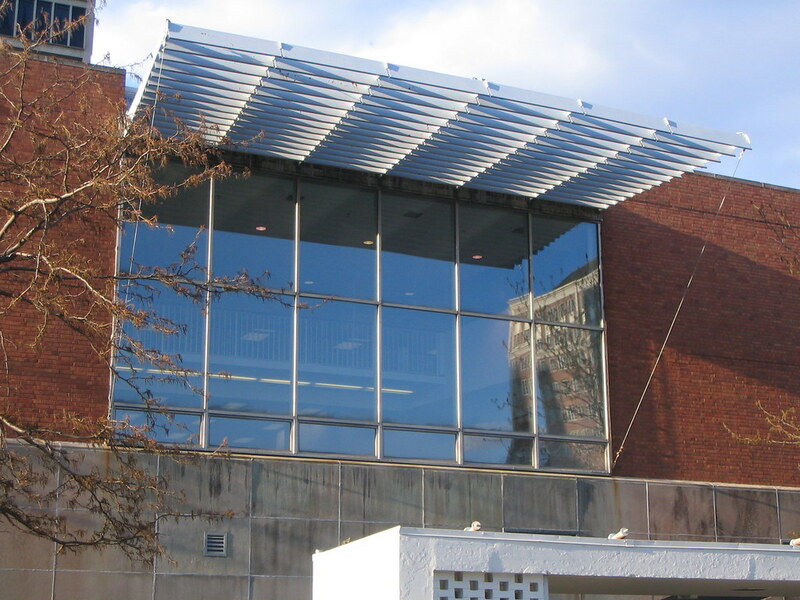 Architecturally though, most of the building's features are intact, including the cantilevered sun screen below and the tightly strung awnings that stretch from the parking garage to the rear entrance doors. 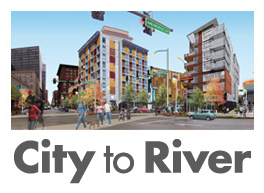 The only problem is that Centene overpaid for the building to the tune of $12 million on the assumption that this cost would be absorbed into the total development cost of the site. Now either Centene has to take a loss on the building, or someone will pay that much for the site with the same thought that the cost will be justified by the redevelopment of the site. Time will tell if someone has the creativity to develop something on the parking garage portion of the site and preserve Harris Armstrong's Forsyth legacy. With Mehlman's proposed development just east, the building (and Forsyth in between) could be poised once again to become a great retail destination. What's happened to the building now? I remember when twas a Dolgin's. Looks like it is going to be demolished after all. Tear down that ugly us bank building across the way. I HAVE A PICTURE THAT YOUR COMPANY ,MAY HAVE GIVEN OUT FOR CUSTOMERS , TO KEEP MAYBE FROM BUYING SOMETHING ??? ANY WAY IT HAS YOUR STAMP ON THE BACK AND IS VERY OLD THOUGHT YOU MAY WANT TO SEE IT . I SENT YOU SOME PICTURES OF IT AND WONDER IF IT HAS ANY VALUE ?? BEAUTIFUL OLD PRINT .